H.S. student invents game on evils of gerrymandering. Arnold Schwarzenegger plays. Josh Lafair, 17, says he doesn't remember when he first heard about gerrymandering. Growing up with older twin siblings in one of the six funky-looking congressional districts that make up his hometown of Austin, Texas, it was a frequent topic of conversation around the dinner table, he says. "It has all the right mechanics of a board game — scheming, strategizing, backstabbing," Lafair said of the way partisans draw House districts to their political advantage. "And we did some research and we found a few things online, but there was no board game." 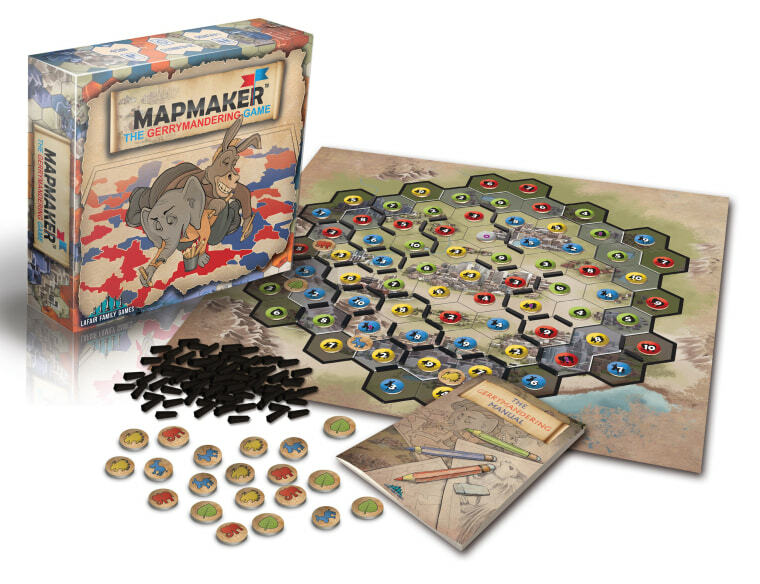 So, after a year of planning and research, Lafair and his siblings drew one up — "Mapmaker: The Gerrymandering Game." They started a Kickstarter campaign in July to actually make the game. They reached their $15,000 initial goal within six hours, and the campaign closed Tuesday with 1,400 backers pledging more than $67,000 to start production. Though not yet publicly available, it caught the attention of anti-gerrymandering activists and politicians online, including former California Gov. Arnold Schwarzenegger, who has made fighting gerrymandering across the country one of his chief causes. "Much better than a smoky backroom where politicians scam voters," Schwarzenegger tweeted. Lafair says his parents — his father an executive of an Austin-based startup and his mother a regional director of the Anti-Defamation League — are happy that the game has been received so positively, but are especially pleased by its educational aspect. To ensure accuracy, Lafair and his siblings spoke to experts like Jonathan Mattingly, chair of the mathematics department at Duke University. Mattingly's work investigating gerrymandering has been cited in court cases challenging district maps in North Carolina and Wisconsin. "They clearly thought a lot about it, and they clearly had been touched by it," Mattingly said. “Leaving their partisan biases behind and just getting into the game and playing it, you may realize how it's a very nonpartisan topic and how it really affects the integrity of our democracy." Rep. Lloyd Doggett, D-Texas, applauded the Lafairs, saying he has seen firsthand how the rules of redistricting have been stretched. Elected to the House in 1994, he has represented three different districts, with three different numbers. "Recognizing that gerrymandering is not a game, these students have creatively developed a game that exposes the challenges," Doggett said in an email to NBC News. "The greatest harm of these crooked lines is not to me or another elected official, but to the many who are denied accessible and accountable representation." Until then, between cross-country practice and getting ready for his senior year of high school, Lafair is responding to the game's backers online and working on a distribution plan. He's become deeply involved in the anti-gerrymandering community, and says more activism is in his future. "What we’re really trying to do, along with a lot of amazing other grass-roots organizations and people out there, is trying to add momentum to this 2021 anti-gerrymandering movement," he said.